This text was published in the Diario Popular, an Argentinean newspaper, on April 27, 2014, but came to our knowledge only recently when we saw it posted in the Spanish blog Amor de la Verdad. The source used by the newspaper appears to be credible: a close relative of Msgr. 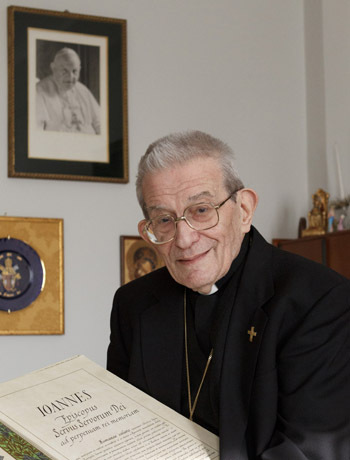 Loris Capovila, today a Cardinal and formerly the private secretary of John XXIII. The Archbishop of Marseille, a past chairman of CEFAL (France - Latin America Episcopal committee), also clearly favors liberation theology, which pleases the progressivists. An Argentine visionary who discerns energies invisible to the average man … asserted that Pope John XXIII had direct contacts with extra-terrestrial beings such as the one that was witnessed and documented by a priest who officiated as private secretary of the Pontiff. Luis Sartori, who since his childhood has the gift of capturing radionic energy that allows access to his visions, told Beyond the Mystery [a section of Diario Popular] that John XXIII, the good, had a singular encounter with a being who descended from an extra-terrestrial spacecraft in the papal vacation residence of Castelgandolfo in the summer of 1961. The information provided by Sartori is not unprecedented, since links of John XXIII with beings from other planets is something that has been reported before. This case must be added to other events with supernatural characteristics. Indeed, it is said that in 1959 the then Bishop of Rome maintained a dialogue with God and the Virgin, who would have revealed to him many mysteries about the future of mankind. Sartori cites an eyewitness account of the meeting that Pope John had with creatures from other worlds. The testimony comes from the religious Loris Capovilla, a family member, a first cousin of Sartori’s maternal grandmother. Capovilla was an assistant and personal secretary of John XXIII. One night in July of 1961, he relates, they were walking through the gardens of the residence when they saw in the sky an unknown spacecraft radiating colored lights approaching them. In a document that reached the hands of Sartori, Capovilla speaks directly of the extraordinary episode, affirming: "We saw a spaceship over our heads. It was oval and had flashing blue and amber lights." The account of the then assistant of the Pope emphasized that the ship soon landed and rested "on the south lawn of the gardens. A strange being came out of it. He seemed like a human except that he was surrounded by a golden light and had large elongated ears." "His Holiness and I knelt down. We did not know what we were seeing, but we knew that it was not of this world, so it should be a celestial event," reported the religious, who witnessed with the Pope the incredible episode. "We prayed and when we raised our eyes, the being was still there. This was proof that we were not having a vision. The Holy Father stood up and walked toward the being. The two talked for about 20 minutes. They did not call to me so I stayed where I was, and I could not hear anything that they said. Finally the being turned around, walked toward the ship and left." "His Holiness came back and told me that the children of God are everywhere, and sometimes we have difficulty recognizing our own brothers." 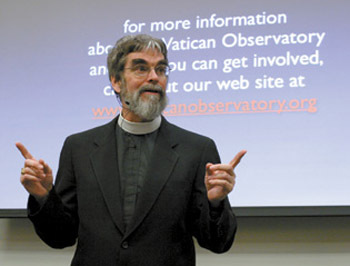 Luis Sartori holds that since this event, which had as a main protagonist Pope John XXIII, the Catholic Church has increased her investigations regarding extra-terrestrials. “What is more,” he affirmed, “the Church accepts the existence of extra-terrestrials and has even joined with NASA in a very secret place in some sort of hidden research center in order to follow night and day the movements” of these beings and their spacecrafts.